Vegan Chickpea Flour Pancakes | oil-free, grain-free, so easy! These vegan chickpea flour pancakes might be the quickest and easiest grain-free vegan pancakes ever. You’ll only need 4 simple ingredients to make them: chickpea flour, sea salt, baking soda and your choice of sweetener. They’re grain-free, gluten-free, oil-free, refined sugar-free, egg-free and dairy-free, all thanks to the magical powder of garbanzo bean flour. Chickpea flour, also know as gram, besan or garbanzo bean flour, is made from ground dried, raw chickpeas. Chickpea flour is a staple in many different cuisines around the world but has been gaining popularity in North American with the rise of gluten-free cooking and baking. From traditional Italian and French socca, to Indian sweets and crepes, chickpea flour dishes can be found in South Asian, Middle Eastern and Southern European cultures, among others. 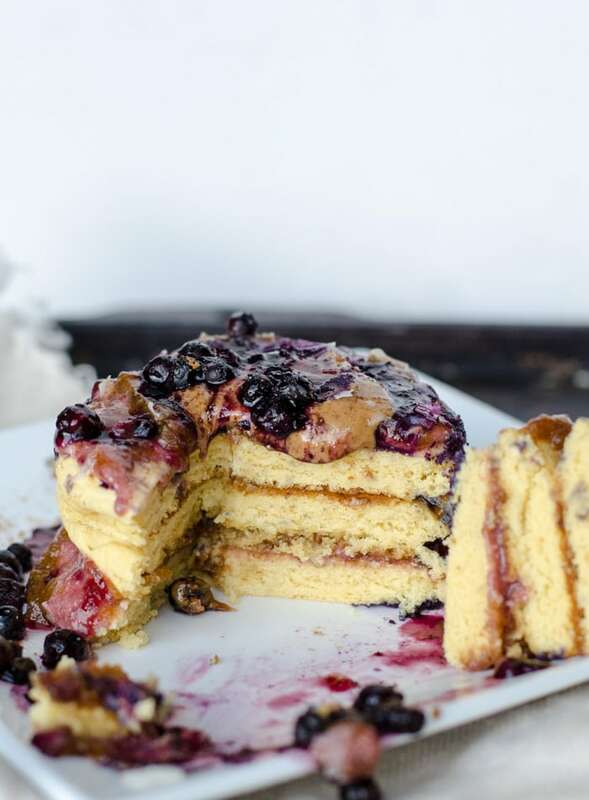 Chickpea flour can be used as a binder in baking, in pancakes and crepes, vegan frittatas and omelettes, as well as in savoury dishes like stews and soups. Chickpea flour is naturally gluten-free, rich in protein, fibre, vitamins and minerals. It also contains iron, potassium, manganese, copper, zinc, phosphorus, magnesium, folate, vitamin B6 and thiamin, so it’s a great way to sneak some extra nutrition in your diet. These might be the easiest pancakes of all time. They literally take about 60 seconds to prep and about 5 minutes to cook. They fluff up nicely but have a dense, almost cake-like texture, that makes them very filling. To make these sugar-free use about 15 liquid organic stevia drops or whole leaf stevia powder, to taste. If using powder, I use 1 tsp. To make them refined sugar-free, use coconut sugar or pure maple syrup. Start with 1 tbsp, add more to taste. This recipe only serves 1 so feel free to double or triple it as needed. Use unrefined sea salt for best flavor and nutrition. Do not use table salt. Use aluminium-free baking powder, if desired. For best results, use a kitchen scale to weigh the chickpea flour. It should be 80 grams. (Edit: I make this recipe often with just 60 grams as well, so as long as it’s between 60-80 grams you should be good!). 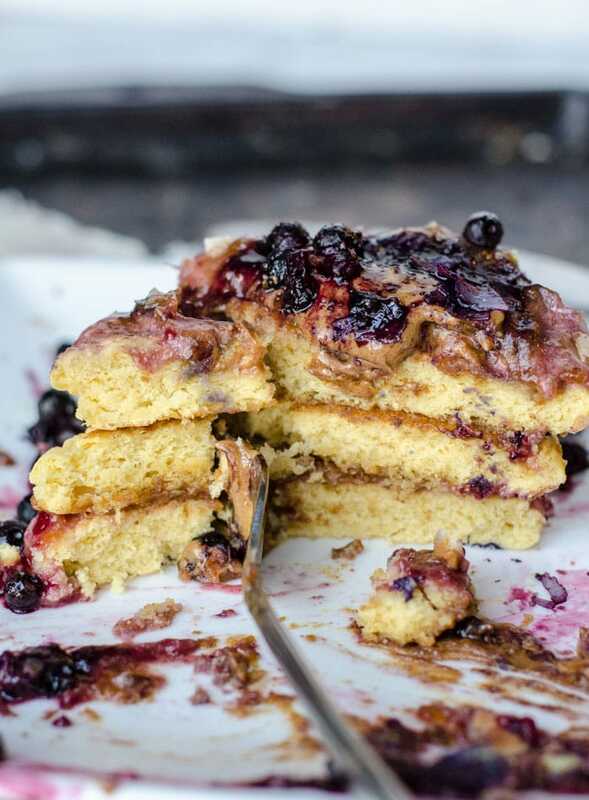 These delicious, cake-like vegan chickpea flour pancakes are completely grain-free, oil-free and can be made sugar-free. They essentially only required 1 ingredient: chickpea flour! These can be made start to finish in about 10 minutes. Pre-heat a pan over medium heat. Slowly add the water until you have a thick but scoopable pancake batter. Scoop the batter into a pan (use a little cooking spray) to make 3-4 pancakes. Cook for a few minutes until starting they look dry around the edges and are starting to bubble, flip and cook for another another minute. Add your favourite toppings and enjoy. Nutritional information is if you make these with stevia. If you use maple syrup or coconut sugar, the carbohydrates and calories will be slightly higher. The water ingredient states: “1/4 + 1 tbsp water”. Is that 1/4 cup? Or 1/4 of a TBSP? 1/4 cup + 1 tbsp 🙂 thanks. Thank you for clarifying! Going to make these this weekend! I’m obsessed with chickpea flour! These genuinely look mindblowing. Will be trying this recipe asap. Wow, it sure looks amazing! I love using chickpea flour, I feel like it gives something different (and better) to the recipe! Made these today and they are amazing! I tripled the recipe for hubby and myself. I added some cinnamon and coconut sugar, and used unsweetened vanilla almond milk instead of water. They came out great, nice and fluffy. Exactly the recipe I’ve been looking for! The only downside is hubby felt it left an odd taste in his mouth, not sure if its the chickpea flour or the baking powder he was tasting. Thanks! Amazing! So glad you enjoyed them. It could have been the chickpea flour, it definitely has a unique taste, especially if you don’t use that much sweetener and I find it varies by brand. They sound great with your subs, thanks for the feedback!! I made them with and without the baking powder & it’s definitely the baking powder that gives it that taste. They’re delicious without the baking powder but they come out thinner like crepes. I tasted the baking powder was gross. I will have to try without. They won’t be fluffy without the baking powder…you could just try reducing it to 1-2 tsp. They’ll work without it but will be very flat..FYI! Thanks. I was a doubter of this recipe, and thought there was no way mine would look as good in the picture, but they’re 100% legit and delicious! Easiest pancakes I’ve ever made, so unbelievably thick and fluffy. I used 1 tbsp of maple syrup for the sweetener and the rest of the recipe was as is. Highly recommend. Would have taken a photo, but they got eaten way too quickly. I think this will become a weekend regular recipe at our house – my son has severe food allergies and these are egg free, DF, GF and still delicious which makes it a real winner. Amazing, I’m so glad they worked out! I hear ya on doubting the recipe, I’ve tried so many online recipes that didn’t come out anything like the photos or what they were supposed to be like, it’s so frustrating! So happy your son can enjoy them too…thanks for your comment. I tried this today for breakfast and they turned out lovely. .I added cinnamon to thee mixture, and used honey as the sweetener, so they browned a bit, but the texture was soft, light and fluffy and very enjoyable and moreish. . So many possibilities, what to top it with? Decisions, decisions… thank you for sharing this quick, easy, and healthy recipe, which I’d like to make again soon..
Haha, such a tough decision, isn’t it? So happy to hear you enjoyed them! This was great, thanks! I added a lot more water because my batter was more like dough, but it was so quick and easy to prepare. I threw in a little brown sugar, ginger, and cardamom. The chickpea flour was pretty strong tasting, so I’m going to try this again with mung bean flour next time. Either way, love how quick and easy this recipe was. Nice, sounds awesome with ginger and cardamom! I’ve found the texture varies a bit between brands so ya, you might need to adjust the water a bit. I made these with Bob’s Red Mill Garbanzo Bean Flour. I’ll have to check out mung bean flour! Glad you liked them, thanks for your comment. I made these in a waffle maker. They turned out great. Kids loved them. I am sure they will be on ongoing staple recipe in my kitchen. Oh awesome, I haven’t tried them in the waffle maker yet! So glad you enjoyed them. Yes they were fluffy and delicious. I made the chick pea flour myself and added 1/2 cup vegan chocolate chips. Cool! I’ve never tried making chickpea flour. They sound amazing with chocolate chips added, I’ll have to try that on the weekend! These are amazing 5 stars. I made mine completely sugar free with a tiny dash of regular salt and they were so delicious. I used a drop of coconut oil on the pan to cook them. Awesome. Thank you so much for the feedback, Jessica! So glad you enjoyed them. I saw that, they looked amazing! Thank you so much. So happy you liked them! Ooh yum..they sound so good with raspberries! I might have to have that for breakfast tomorrow! Glad you and your family enjoyed. I made these again today but this time made them savoury. I omitted any sweetener, and added half tsp black pepper, half tsp dried oregano, a little chopped spring onion/scallion, a little finely grated low fat cheddar, and added about an inch length of tomato puree squeezed from the tube. It was good that way too. Same recipe but feels like you’re having something different, so you can vary it on various days. Love how quick and easy and healthy it is. That’s awesome. I’ve made them savoury too, so good! I love your add-ins, never thought to add tomato paste. I’ve made them thinner too so they’re more like a crepe, which is awesome sweet or savory! Glad you’re enjoying. It does depend on the chickpea flour you use, I find they vary quite a bit by brand. I used Bob’s Red Mill. You can also add more water and make a thinner, crepe-like pancake, up to you! Thanks! These were amazing thank you! I have been looking for a gluten free vegan pancake recipe for so long, and I only seem to find them with bananas, but I don’t really like bananas very much and they add a lot of sugar to the recipe, these came out perfectly fluffy and light, and delicious! thank you! This made my day and it’s only morning ;-)! Wow, so happy to hear that! You made MY day! Just FYI, 1/2 cup (220 calories) of Bob’s garbanzo flour is 60 grams, not 80. I am looking forward to trying these; thanks for the recipe! Thanks! I must have used 80 grams in the recipe, so a generous 1/2 cup I suppose. That’s why I put the gram measurements, as it’s exactly what I used and volume measurements can vary so much. Thanks for the feedback though! Hope you like the recipe! These were good but still a little ‘beany’ in flavor for me. I replaced half of the bean flour with oat flour and that seemed to mellow out the flavor. Obviously you lose a bit of protein but oat flour is still pretty healthy. Try it out if you get bored of the regular recipe or want to try something new. Cool, glad you liked them! They have a distinct flavour for sure but I don’t mind it. I don’t find you get the same fluff with oat flour but it does work, I’ve made them 1000 ways..haha. Glad you found something that works for you. This recipe is AMAZING!! THANK YOU THANK YOU THANK YOU! I can’t believe how flexible it is. I can make them savory by omitting the sweetener, or I can make them sweet by adding fruit or dairy free chocolate chips. I was afraid that they would taste funny because you can smell the garbanzo when it’s wet, but you can’t taste or smell the garbanzo once it’s cooked. Totally, you can’t really taste it once it’s cooked up. So glad you liked them! 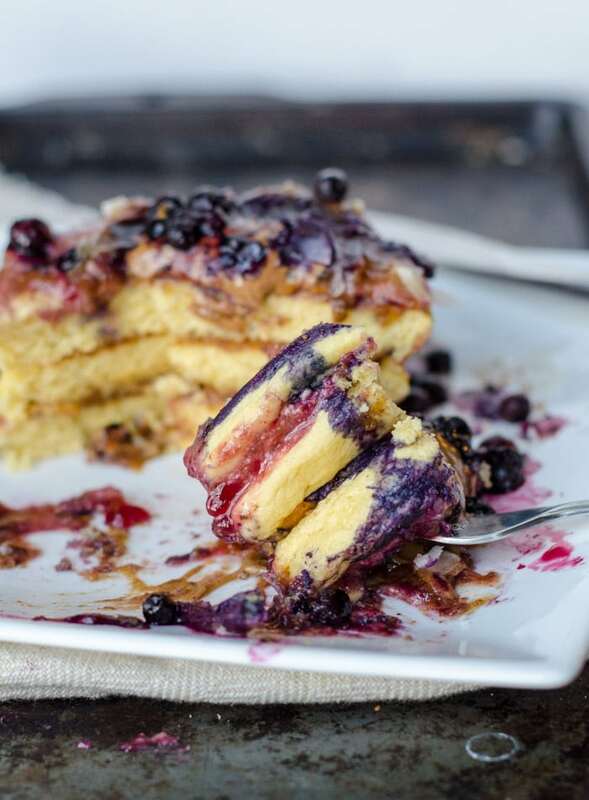 It’s my go-to for quick and easy, no-fail pancakes! 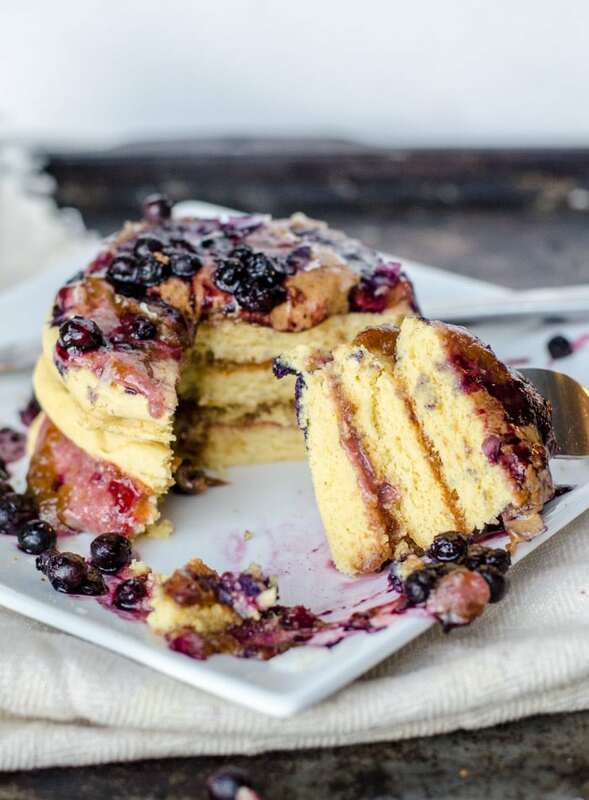 I’m not one of those women that say everything they eat is the best thing they’ve ever eaten so trust me when I say these pancakes are the best alternative to APF pancakes that – I have ever eaten!! I’m serious, I had low expectations but these would have blown my high expectations out of the water. I’ve tried at least three pancake recipes over the last week and they all failed me. These were light, fluffy and tasted delicious. I’m completely full and satisfied. I didn’t need any toppers, they were that good! Amazing..haha. Agreed, they are so good and you can’t really mess them up either!! I was looking for simple vegan chickpea flour pancake recipe and this one haven’t disappointed. They came out perfect!!!! And only 3 ingredients!!!! My fiance was very impressed also. Thank yoy very much. That’s awesome to hear! So glad you liked them. I’m so glad you enjoyed this recipe! 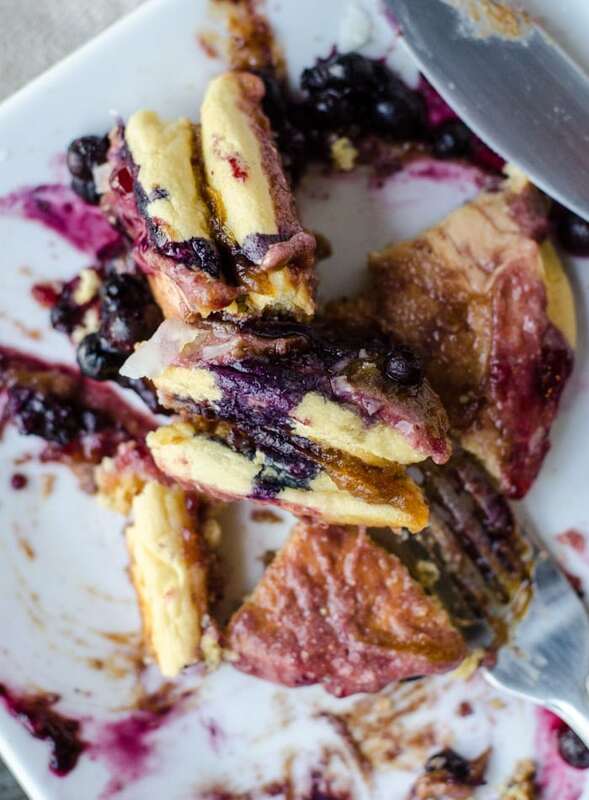 I’ve had sooo many failed, gross pancakes from recipes I’ve tried online, especially trying gluten-free ones, it’s so frustrating! So happy this one worked for you. These were RIDICULOUSLY filling. As in, I was full for 5 hours after eating these, which never happens. And they were so yummy and easy! Awesome!! I love it when meals keep you full, especially pancakes. Chickpea flour has a decent amount of protein and fibre in it so that could be why! Glad you enjoyed the recipe. You are so very welcome! I’m so glad your family enjoyed them! Oh my gosh this was such a DISAPPOINTMENT! Recipe was literally disgusting. I was going to make some for my husband and myself for breakfast but after tasting one I threw the rest of the batter away! Awful, bitter taste. I just know this would not of been a smash hit at the breakfast table. Hands down one of my favorite recipes! Soooo easy, few ingredients, delicious and filling! And bonus: loved by my picky toddler! Win all around! I.make a chickpea omelette often. These are great. I add fruit and some coconut whip on them to sweeten them more. They keep me full forever!! This is the best review ever, haha!! Thanks so much! And congrats on your race, that’s awesome. guilt free! A family favorite at my house! Tried these today, really good! I quadrupled the recipe to make a fanily sized batch but i only doubles the baking powder since it looked like a lot me, turned out great! Topped with chai jam and a splash of maple syrup ???? Really happy to find a quick easy recipe that’s healthy with a lot of protien. That’s awesome, Kelly!! So glad you liked them. Absolutely divine. SO, so deicious and easy to make! Definitely will be making these again! Awesome, glad you liked them! These turned out amazing! I have been trying to find a healthier pancake recipe that isn’t just banana and egg, and this one worked and turned out great! I added a bit of apple cider vinegar to it as well which I think helped make it fluffy. They flipped perfectly without falling apart either. Awesome, so glad you liked them!! A little ACV or lemon can help with fluff for sure 🙂 Thanks for the comment! I have been trying to find a healthier pancake recipe that isn’t just banana and egg, and this one worked and turned out great! I added a bit of apple cider vinegar to it as well which I think helped make it fluffy. This was bad. May as well be eating plain chickpeas. The recipe needs work. I love these! They are uber-fluffy but also have a densness that I love in pancakes. A previous reviewer said they taste like chickpeas, but I didn’t notice at all, despite adding zero refrined sweetener. Instead, I mixed in 1/2 banana and a dash of cinnamon, the perfect amount of subtle sweetness! I love how simplistic this recipe is because it allows you to experiment with different flavors and add-ins. I’m planning to try the recipe again this morning, except this time with figs, walnut raw honey, and cacao. ???????? Amazing…I agree about the flavour. You can taste it in the batter but not once it’s cooked. I only add a tiny pinch of raw stevia and they taste great. Sounds amazing with banana and cinnamon added. Those other add-ins sound soooo good, you’ll have to let me know how that is! Thanks for your comment and review! I am guessing that the Bob’s redmill brand garbanzo bean flour must be non-negotiable for this recipe. I used a different chickpea flour with disastrous results, it was super fine, so it clumped horribly like no flour I’ve ever tried. There were tiny hard clumps of dry flour in every bit of pancake, so I guess I should have sifted. I make pancakes every day and have never seen anything like it. The flavor was like soap, bitter and spicy and hard to rinse out. Most people seem to like this, so if anyone else gets soapcakes like I did, perhaps they need better flour. I make these a few times a week with generic chickpea flour from my local grocer, and I’ve used other brands as well..maybe it was just the brand you used or it was off?? I’ve never heard of that happening! This recipe is super popular and much-loved so I’m not sure what went wrong. Sorry they didn’t work! Added one ripe banana and 4 dates for sweetness. Mashed them wit a fork. 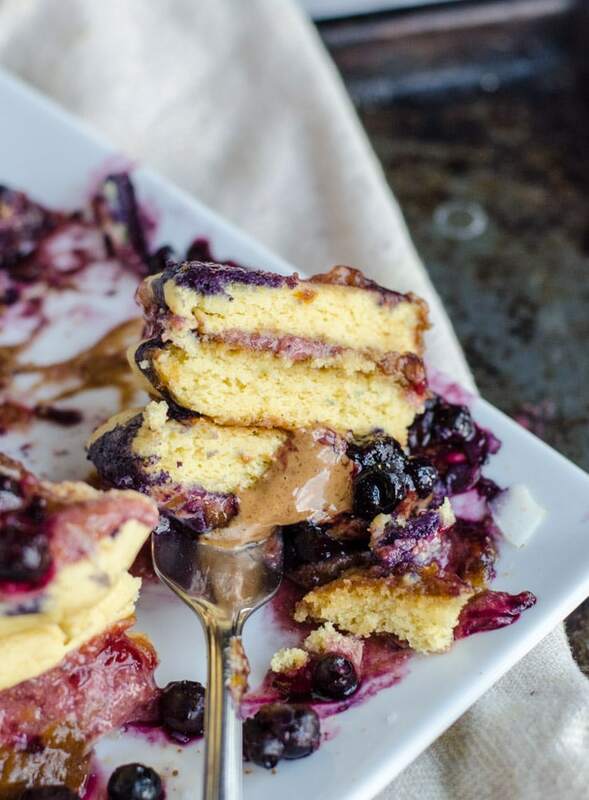 Entirely healthy pancakes! Perfect! Love those add-ins, sounds great. Glad you enjoyed them! These were incredible and so easy. Thank you I only used 1 teasooon of baking soda as I had read some people say they tasted soapy. It worked fine and no soapy taste ???? That’s great, Nathan. So glad you enjoyed them! I made these and they are really good but they w e really dry. Does anyone have any ideas what I could put in next time? I already added lemon and did almond butter instead of water and they are still dry. Hmmm I’m not sure, I don’t find them dry so I can’t think of anything. Maybe some applesauce? I feel like that or anything similar will make them too dense though. Let us know if you try anything. Omg, yum! Made them w baking soda and apple cider vinegar instead of baking powder. Deeelish and plenty fluffy. Also used frozen organic blueberries in them, no syrup needed! Thanks! I have to admit I was sceptical before trying these, but my goodness they are great! An instant new favourite in our home, thank you so much! Wonderful to hear! So happy you enjoyed them. So this whole recipe is 3-4 pancakes and is one serving? excited to try this! I think a little less salt and baking powder would be great, for some reason to much of it makes my tongue burn. I put a little bit of cinnamon to make it naturally sweet. It really is a life -well- taste saver! I’m 99% usually a lurker, but had to comment on how happy this recipe made me!! Was a bit discouraged with chickpea flour after a few flops, but this recipe WORKED WONDERFULLY!!! I used date syrup as my sweetener and added baked figs in my pancakes. Thank you, thank you!! So glad you liked them and found a chickpea flour pancake that worked! I love these too. They sound ammmazing with figs in them! Thanks for letting me know. Made these today but with bicarb soda instead of baking powder. Turned out fluffy and wonderful, no after taste, but no need to add salt. 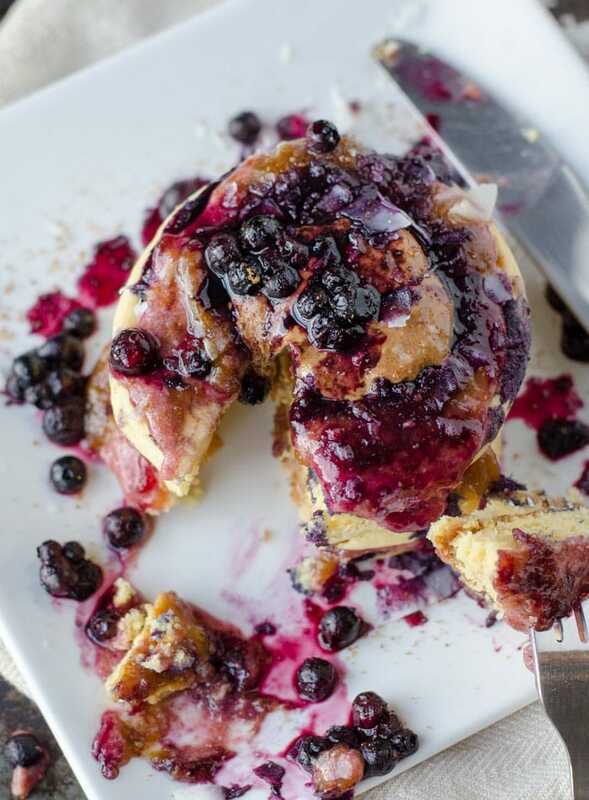 We topped ours off with a mixture of mixed berries, honey and cinnamon simmered in a saucepan. Delish! Awesome! Thanks so much for the comment. So glad you enjoyed them. Would adding almond milk be okay or would it affect the texture? Looking forward to trying these out! I would recommend making them with water, not almond milk. It actually does affect ththe recipe. Enjoy! Thanks for the recipe. I’m going to make them tomorrow. Quick question, do you add the tablespoon of maple syrup in step 2 with the dry ingredients? thanks! It’s not a big deal when you add it but I’d suggest adding it with the water. Enjoy! So, I made these today and topped them with some banana and a peanut butter maple sauce and it was probably the best pancakes I’ve ever had. Thanks for this amazing recipe. Woohoo!! So glad you liked them!! I love this recipe too. So good, so thick and fluffy and so easy! Thanks a lot for the review. Glad you liked them!! They are so quick and easy to make, aren’t they? This is a delicious and simple recipe! Loved how easy it was to cook. I added some coconut oil to the batter. Perfect! Thank you. So happy you enjoyed it! Isn’t it the best? You can’t beat how easy it is! Just discovered chickpea flour in my low/grain free life and these are amazing!!!! Glad to hear it Nicole!! I love these too..such a great recipe! I added vanilla to make them taste a little more like traditional pancakes. Otherwise they were very good. Glad you enjoyed them! Vanilla is a great addition. Admittedly I made some tweaks, so I cannot rate the recipe just as it is. 1.5 tsp of baking powder is a lot for 80 grams of besan, so I reduced it. To make waffles and pancakes for the week, I made the recipe x8. 640 grams besan, same amount of salt per recipe (*8), 8 Tbs organic cane sugar for tenderness, 2 Tbs vanilla, 1 tsp almond extract, 2 cups soy milk plus about 1 cup water, and I think I ended up adding 8 tsp baking powder plus 2 Tbs apple cider vinegar to make sure the baking powder was all used up. Reading the reviews about the baking powder taste concerned me and the recipe worked great. I used non-stick spray for the waffle iron and coconut oil for the pan. These are fluffy, tender, but not falling apart- perfect. 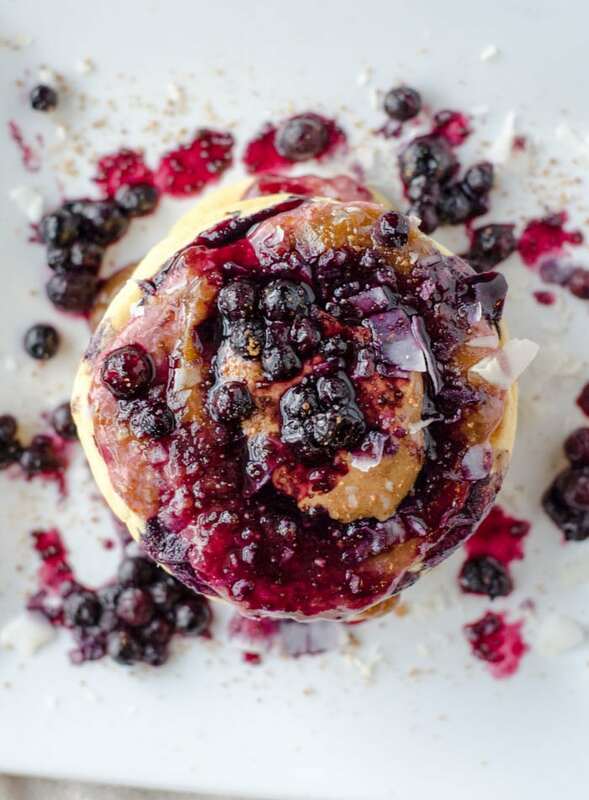 We topped with earth balance, mixed berries, and pure maple syrup. I feel nice and full from just 2 small-medium sized pancakes, and not in a bad way. Thanks for posting this recipe! I’ve found best results with water in this recipe. Enjoy! I can’t believe how delicious these pancakes were. My daughter is vegan and I’m not but am leaning in that direction. Using the Bobs garbanzo flour must be essential because rarely do my baking recipes work out….This was the best! And thank you for responding to comments a year later…you are very thoughtful. No one does that 😀. So glad you enjoyed this recipe! It’s still my go-to pancake recipe. I love them! I tried this tonight and loved the option of a chickpea flour pancake as an alternative to wheat flour. I followed the directions meticulously using my kitchen weigh scale and kitchen measuring aids. I ended up with something fairly thick and tried cooking one pancake but wasn’t happy with the result which ended up misshapen and dense. Next I added a bit more water and tried another pancake which was much easier to handle and was round more airy. Finally I added more water still and ended up with a consistence I am used to working with (with flour pancakes) which allowed me to simply pour the batter into the pan and end up with a perfect, round, light, airy pancake. Then I started again with a new batch, following the same recipe (but with enough water to make a pourable batter) and also added one tablespoon of ground flax seeds to this batch. I chose this amount simply because this is the amount of flax seeds suggested for someone to get enough omega 3 fatty acids in their diet. This made several excellent pancakes. I think I can now add this to my recipe bank. That’s great, Brian! I’m so glad you were able to get them just right. I think it depends on the brand of chickpea flour as I’ve had success with anywhere from 60-80 grams of flour. It also depends on how thick you like your pancakes! You can add more water too and they’ll come out more like a crepe! Thanks for the feedback!